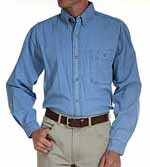 Wrangler rugged wear basic denim long sleeved shirt. Left chest pocket with button closure and pencil slot. Double button adjustable cuff. Garment washed for softness. Made of 100% cotton denim. Color available and shown is vintage indigo stonewash. Matching Wrangler relaxed fit jean also available. 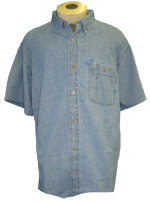 Wrangler rugged wear basic denim short sleeved shirt. Left chest pocket with button closure and pencil slot. Double button adjustable cuff. Garment washed for softness. 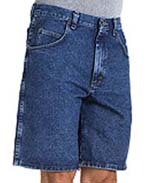 Made of 100% cotton denim. 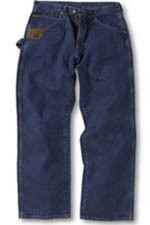 Wrangler Rugged Wear basic five Pocket Relaxed Fit. Comfortable U-Fit Crotch. Extra Deep Front Pockets. Pockets Double Stitched at Stress Points. Solid Brass Zipper. 10" Inseam. Made of 100% Cotton. Enlarged picture shows both colors. Relaxed fit gives you room through the seat and thigh. Simply the best good looking, great fitting, hard working, 5 pocket jean. 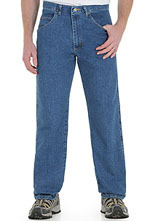 Extra deep front pockets, 8 1/2" leg opening for boots. Zipper fly with comfortable U-fit crotch.